This London Dry gin is carefully distilled to the original secret recipe. 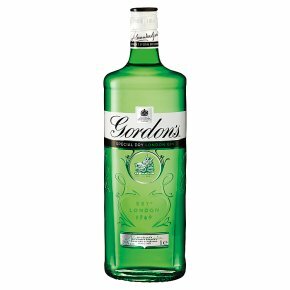 A unique blend of juniper berries, citrus and other herbs and spices gives Gordon's its distinctive crisp taste and fragrant aroma. A classic drink when poured over ice with tonic water. Gordon's Gin comes from the unique blend of botanicals centred around juniper berries. Gordon's® London Dry gin is carefully distilled using a secret recipe. The distinctively refreshing taste comes from the finest handpicked juniper berries and a selection of other botanicals. It's the taste that's made Gordon's the world's best-selling London Dry gin.